If the K61 had never been released, we wouldn´t really miss it, but it´s a reasonable controller keyboard that ships with some decent software. A few more knobs would be nice. Other ’boards offer slightly more bang for your buck. Hardware giants Korg have released a fair few MIDI controllers now, but for the most part, they've been mid-range models adorned with bells and whistles. The new K-Series models represent the company's attempt to create a strong budget controller brand - while they retain the familiar Korg feel, they're far less sci-fi-looking and feature-packed than the devices that make up the more expensive Kontrol range. 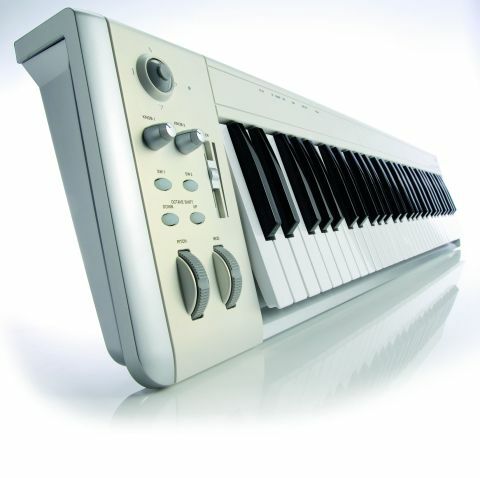 The K-Series features 25-, 49- and 61-note keyboards. We're looking at the largest of these here, and on first inspection it looks very minimal indeed. In terms of build, it's a fairly slim, reasonably tasteful mix of cream and silver plastic, but the usual assortment of knobs and sliders that we're used to seeing on controllers these days is conspicuous in its absence. In fact, you could be forgiven for thinking that the K61 is a totally pared-down, no-frills controller, but closer examination of the area above the pitchbend and modulation wheels reveals a small control panel - this contains octave transpose knobs, two soft buttons, a volume slider, two knobs and a weird little joystick. The functions of all these controls (aside from the octave transpose buttons and pitchbend wheel) can be edited using the bundled K-Series Editor software. The slider, mod wheel and knobs can be assigned to any CC, and the soft buttons can be assigned to either program changes (with 'off' and 'on' values from 0-127) or CCs. The unusual joystick has two modes: one where it functions as a common or garden X/Y pad sending out data on two CC channels, and another where it functions as a kind of substitute mouse. Left-clicking is achieved by pushing the joystick in - like you would a PlayStation or Xbox thumbstick - but there doesn't seem to be any way of right-clicking. We can't see this function being particularly useful in the studio, but it might be appreciated by live players. As well as the editor, a few bits of special edition software are included (see the Fun on the M1 boxout), but that's about your lot (though a USB cable is supplied, obviously). To be honest, the K61 is of exactly the sort of quality you'd expect given its price - if you want more features, you'll have to pay for them. Keyboard players in particular will enjoy the classic workstation sounds provided by the M1 Le software, but if an abundance of controls is on your must-have list, you'll need to look elsewhere.